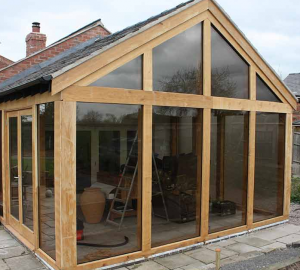 When it comes to glazing an oak frame building, there are two different methods – direct and external. Both methods have various benefits and downsides, and it really does come down to individual frames’ requirements as well as the person carrying out the work to decide which method will be used. Here, we run through the process of the two methods, as well as their individual benefits and downsides in relation to each other. Direct glazing is where you can fit a pane of glass to an oak frame building through simply mounting it either within the frame or, alternatively, onto the outer face of the frame. This method is extremely practical as well as cheap, particularly where there may be a large number of corner posts in the frame. Though much more practical, there is of course the problem of the green oak shrinking or moving during its maturity. On top of this, it can be difficult to incorporate opening windows when glazing in this way. External glazing is where the glazing is fitted to a separate oak frame, which is then fixed to the building’s oak frame. This method is better suited to exposed locations where the structural frame of your building can support a light external frame with which to carry the roofs, windows and doors. A light and stable exterior which can be fixed to the building’s oak frame is seriously beneficial in areas that are particularly exposed and may fall victim to harsh weather conditions and wind. This method involves more processes and, as such, is more time consuming as well as more costly, though its benefits are often enough to outweigh this slightly higher price, particularly for buildings which really require the benefits it offers. As discussed, when deciding which method of glazing to opt for on your oak frame building, it really does come down to the structural requirements of the building itself as well as the budget and time available to the person requiring this work.